The PCB panel is dried and is usually heated to remove excess moisture. Using details from the drilling files submitted by the circuit board designer, the PCB fabricator proceeds to drill the necessary holes for the central layer. 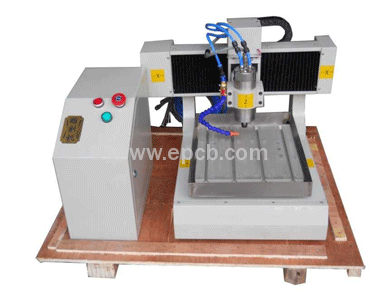 This starts with drilling the registration or locating holes on the periphery of the panel, and the CNC machine changes its drills to match the diameter for individual holes specified in the drill file. The registration holes are necessary for aligning subsequent layers. To obtain the correct pattern of tracks on the two sides of the panel, fabricators use a combination of a photographic process followed by a process of chemical etching. Typically, the copper surfaces on the drilled panel are covered with a thin layer of photoresist. Each side is then exposed to UV light through a photographic film or photo-mask detailing the optically negative pattern of tracks specified by the designer for that layer. UV light falling on the photoresist bonds the chemical to the copper surface, and the rest of the unexposed chemical is removed in a developing bath. This stage is usually supplemented with a visual inspection. When placed in an etching bath, the etchant removes the exposed copper from the panel. This leaves behind the copper traces hidden under the photoresist layer. During the PCB etching process, concentration of the etchant and time of exposure are both critical parameters to obtain optimum results. Stronger than necessary concentration and a longer time of exposure can result in over-etching copper from under the photoresist, leading to tracks with widths thinner than specified by the designer. After successful etching, the photoresist is washed away to leave the necessary copper tracks on both sides of the central layer. Although the photographic process is very popular, other methods are also available. For low volumes or prototype PCBs, an etch-resistant ink may be transferred onto the copper surface using a silk screening process, with the silk screen representing the optically negative pattern of the tracks required. Another dry process uses a specialized, highly accurate milling machine to remove the unwanted copper from the surface of the panel. The machine uses inputs from the documents supplied by the designer to drive the automated milling head. However, as the process is time-consuming, it is suitable only for very small quantities of PCB.